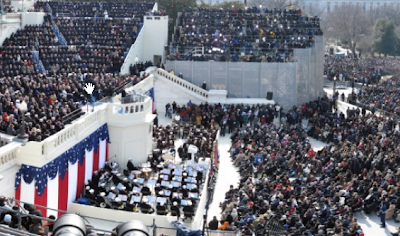 A 1,474-Megapixel Photo of Obama’s Inaugural: "My final photo is made up of 220 Canon G10 images and the file is 59,783 X 24,658 pixels or 1,474 megapixels. It took more than six and a half hours for the Gigapan software to put together all of the images on my Macbook Pro and the completed TIF file is almost 2 gigabytes. Use the controls to zoom and pan around the photo. You can also double click to zoom in and double click again to get even closer."